On May 5th 1975, Elvis performed a concert in aid of the McComb tornado victims at the State Fair Coliseum, Jackson, Mississippi. Elvis raised $108,860 to help residents who were affected by the devastation. The audio for this show is damaged beyond repair. However, Sprit Of Jackson, MS includes two other shows from the State Fair Coliseum. Just over a month after the charity show, Elvis performed in Jackson again and this show is featured on Disc 2. Disc 1 stays at the same venue for a concert given in September 1976. 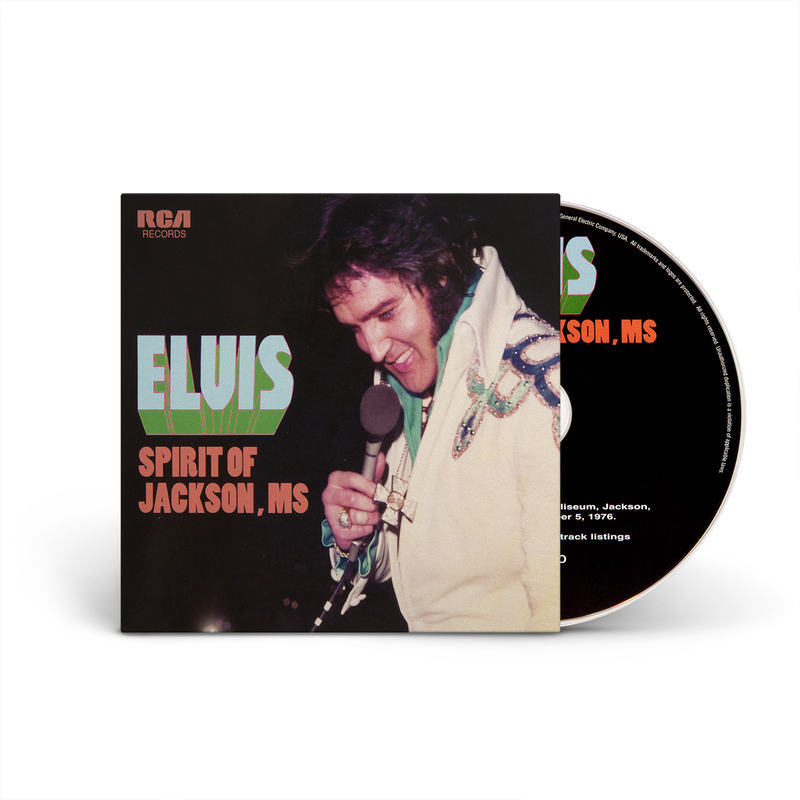 Sprit Of Jackson, MS is a 2-CD digipack. Recorded live at the State Fair Coliseum, Jackson, Mississippi June 9, 1975. Tracks 18 & 19 recorded June 8, 1975/evening show at the same venue. Elvis seemed at his best when facing a challenge, performing benefits or entertaining audiences with whom he had a "connection." It's unfortunate that the original show to raise funds for tornado victims was damaged. It likely was one of his better shows of the era. However, the two chosen for this set are very good shows. Elvis seems relaxed and enjoying the crowd in his native Mississippi. His voice his in good form and the sound quality of the recordings is quite good. excellent set...both concerts show Elvis in great voice and havin' fun with his fans. Elvis was clearly motivated by this audience...the concert in this set from '75 is really good. the show in '76 is very good as well. outstanding performances on Hurt,America,Thats Alright Mama and How Great Thou Art from the '76 show...T-R-O-U-B-L-E,And I Love You So,The Wonder of You,Mystery Train/Tiger Man,Help Me Make It Thru The Night and as always...Trilogy are among the gems from '75.